"BJ Wilson, Procol Harum's Drummer"
"Beloved BJ, on the tail of a comet, you can play upon the fragments from exploded stars …"
So wrote a devoted fan of the great drummer, at the head of the Barrie Wilson page at the Rock and Roll Heaven website. 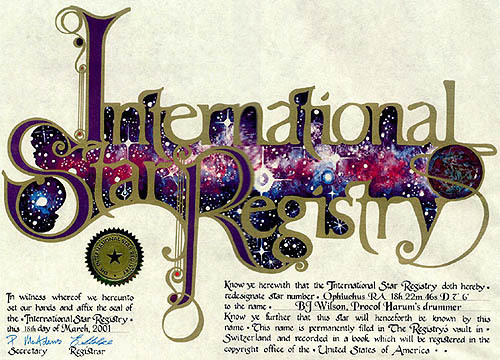 'Beyond the Pale' – in consultation with Pam Quinn, Barrie's sister – decided to mark the fifty-fourth anniversary of the great percussionist's birth by naming a star after him at the International Star Registry; accordingly the star formerly known as #00044501811 (in the Constellation of Ophiuchus, the Serpent Bearer, whose co-ordinates are RA 18h22m45.89s Decl. 07d 06' 27.61") will henceforth be known as BJ Wilson, Procol Harum's drummer. 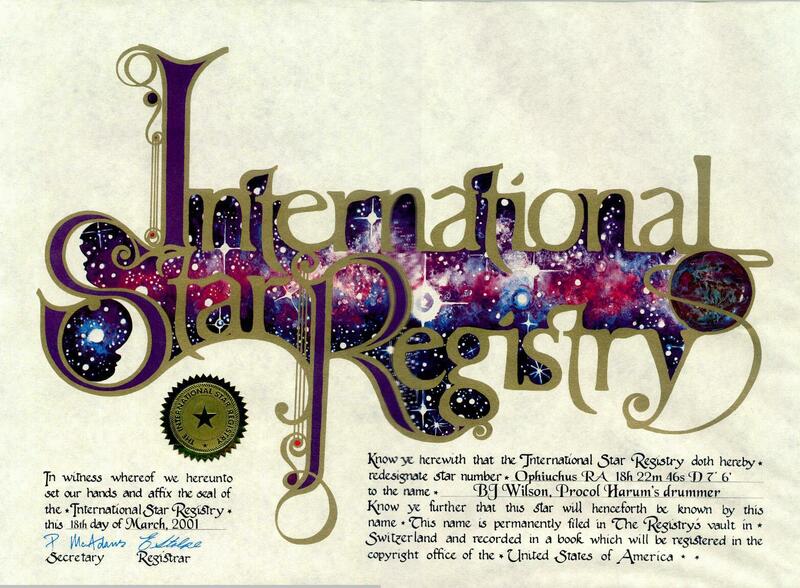 The new star name and telescopic coordinates have been registered in the International Star Registry's vault in Switzerland and recorded in the astronomical compendium Your Place in the Cosmos, Volume VI, © in the USA. Due to issues of seasonal orientation and time zones, it is impractical, if not impossible, to provide a universal, layman's method of simply stepping out-of-doors tonight and finding the constellation Ophiuchus, other than to say that it is visible just outside the bright clutter of the Milky Way. If I then were to mention that it's at the ecliptic and lies across the celestial equator just south of Hercules, then you begin to get the idea. 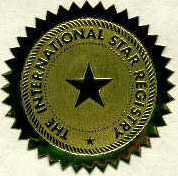 More difficult again is the task of locating BJ's star within it. 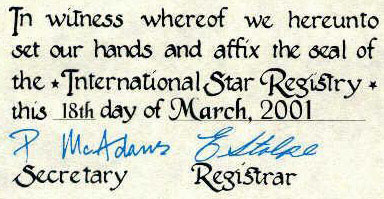 But for the intrepid novice stargazer, the provided celestial coordinates are universal and applicable to the most rudimentary of published star-charts for simply locating his constellation; literally as easy as using the numbered and lettered coordinates an any terrestrial map. Simple enough? Well, not quite. The star is an 11.5 magnitude. Under the best of viewing conditions, i.e. well away from city lights, magnitudes of 0–5.0 are visible to the naked eye. Magnitudes of 5.0–10.0 are visible with reasonably good quality binoculars. In short, BJ's star would require a small telescope and a competent astronomer to locate and view it. While we might suppose that virtually no one will be that insistent upon an actual astronomical sighting (short of trawling the archives of NASA's Hubble Telescope photos) we can perhaps find satisfaction in the symbolic aspect of a perpetual memorial to BJ Wilson on record. As an incidental footnote, when the zodiac was originally named, the ecliptic (path of the Sun) did not cross Ophiuchus. Due to celestial precession, the Sun now spends quite a long time in the constellation. Thus is the reason that no one today can boast that their astrological sign is Ophiuchus. BJ, you have this one all to yourself!